In a bowl, mix first 6 ingredients. Spray a foil lined cookie sheet and form 2/3 of the meat mixture into a loaf with your hands. 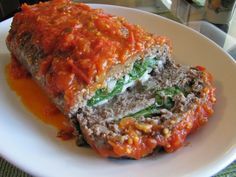 Push in a shallow spot for the filling to go lengthwise down the center of the meatloaf. Fill with ricotta cheese, then top with spinach. Cover with remaining meat mixture and seal all around. Bake at 375 degrees for 20 minutes. Remove from oven and pour your favorite Cannizzaro Sauce over the top. Top with mozzarella cheese and put back in the oven for 10 more minutes. Let cool for 5 minutes, slice and serve!